Steve Jobs Theater at Apple Park, photo by Recode's Dan Frommer from September 2017. If I were allowed to visit Apple Park, the first thing I would do is take off my shoes. In the most famous photographs of Steve Jobs, he sits, shoeless and cross-legged, on the hardwood floor of his Menlo Park bungalow, lit by the glow of a Tiffany lamp. The implication is simultaneously that he is above material things and that only the best will do. Why have an ugly sofa for the sake of having a sofa? Particularly when you have such a nice floor. Barefoot, you feel the world through your feet. You are far more connected to texture, to transition, to temperature, without resorting to running your fingers along a wall, or leaving sweaty handprints on pristine surfaces. 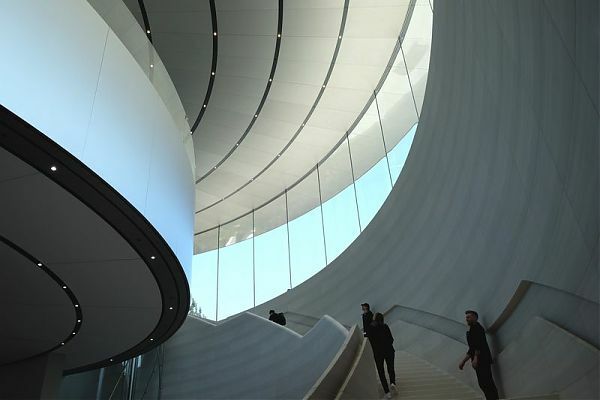 Apple Park, so they say, has been designed to be seamless: the office building is a circle; the Hilltop Theater, a glass cylinder; the four-story, 440,000 pound glass doors slide noiselessly; a white-tile tunnel takes you to your car. Once you’re inside, nothing should interrupt your progress or disrupt the view. Glass fins protect the glass walls from unsightly streaking. The triumph of Apple Park, it would seem, is in these obsessive details, which elevate it above the common sorrows of architecture (that concrete pour that went wonky, that threshold that won’t lie flat) and into the realm of product design. Small things can be perfect, big things cannot, they are just too much. Unless, it seems, you have the money of Jobs. In 2017, I wanted to experience this mirage for myself. But so far, Apple has let in journalists only to ooh and aah, not to pick or contextualize. They want you to admire the glass back of the new iPhone 8 but not drop it.